Thee in luck! 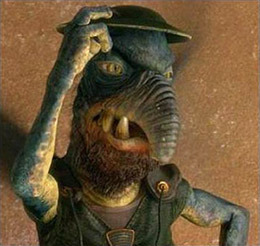 This month’s recipe is in honor of Tatooine’s most loveable scumbag, Watto. He’s a mind-trick-proof, elephant-nosed, gambler that knows a lot more than outlanders might think (even if Qui-Gon did outsmart him). His small junk shop sells everything from a T-14 Hyperdrive Generator to moobian torsion valves. But republic credits aren’t good enough for this Toydarian, only real money!! Okay… He did own slaves (I said he was a scumbag!) but he wasn’t cruel to Anankin and Shmi. He gave them their own home, and even let little Ani off work early sometimes. And technically, he won them from Gardulla the Elder so it’s really those gangster Hutts that are the problem. 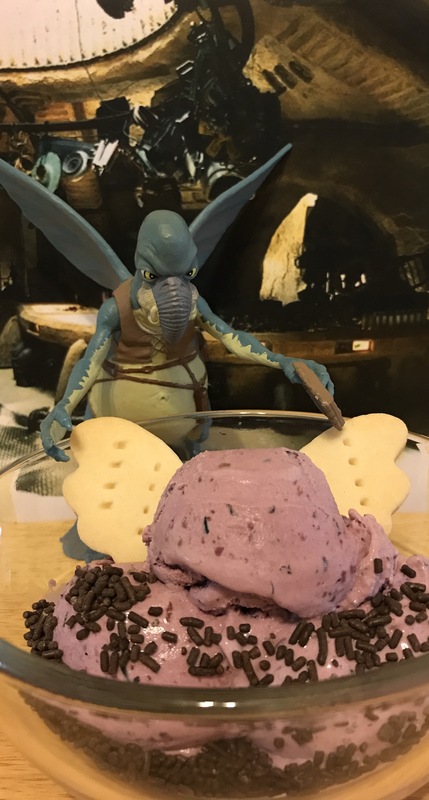 This recipe features black and blueberry gelato with shortbread cookie wings and chocolate jimmies to represent Watto’s beard stubble. If you’re a bigger fan of Attack of The Clones Watto, feel free to use some of the leftover shortbread dough to make a little hat. Living on Tattooine can be tough, so why not take a break from roasting beneath two suns to enjoy a delicious bowl of Watto Gelato? It’s much more refreshing than a Klatooine paddy frog, probably. 1. Place the blueberries, blackberries, 1/2 cup sugar, and lemon juice in a food processor and puree until smooth. Set aside. 2. Set a saucepan over medium heat, add the milk and vanilla extract and bring to a simmer. Do not let it boil! It will curdle! 3. While your milk is heating up, whisk together the egg yolks, egg, and 3/4 cup sugar in a medium-sized bowl, until thickened and pale yellow. 4. Very slowly whisk a small amount (about 1/2 cup) of the hot milk mixture into the egg and sugar mixture, to temper the eggs. 5. Slowly whisk the tempered egg mixture into the milk mixture on the stove. 6. Stir constantly until the mixture thickens slightly, just at the point of simmering. Again- Do not let it boil. 7. Remove the pan from the heat. Pour the custard into the bowl of an electric mixer, and let it cool slightly for a few minutes. 8. Add the cream and beat well with a whisk attachment. 9. Add the berry mixture and mix well again. 10. Cover with plastic wrap and chill overnight in the fridge (or for at least 4-6 hours). 11. While the mixture is cooling, make the cookie wings:Preheat the oven to 300°F. Line a baking sheet with parchment paper, and set aside. 12. In the bowl of an electric mixer, beat together the butter, sugar, vanilla, and almond extract. 13. Add the flour 1/2 cup at a time, beating well after each addition. If your mixture is extremely dry and crumbly (humidity in the air can greatly affect this recipe) dribble in up to 1 tablespoon of water until it comes together. This is a stiff dough. 14. Take a portion of the dough, and roll it out to about 1/4″ thickness. 15. Using a wing-shaped cookie cutter, cut out several wings and place onto your prepared baking sheet. 16. Use a fork to prick the wings all over to allow steam to escape as they bake. 17. Place your wings into the oven and bake for 20 minutes, or until the edges are light brown on top. 18 Allow wings to cool on the pan for 10 minutes before removing to a wire rack to cool completely. 19. Once your gelato mixture is completely cool, pour it into an ice cream/gelato maker and follow the manufacturer’s instructions. My ice cream maker takes about 30 minutes. I also recommend putting your finished gelato in the freezer for about an hour to let it really harden up before you try to scoop it. 20. To serve: Place several scoops of gelato into a bowl. 21. Add two wings and then sprinkle the bottom of each scoop with chocolate jimmies. 22. Enjoy while betting on a pod race.